Crude oil prices retreated to $42/bbl on NYMEX, hitting the lowest levels seen since September 2010, according to ChemOrbis Price Wizard average. Brent futures also came down to $49/bbl late last week, touching lows last seen early this year. 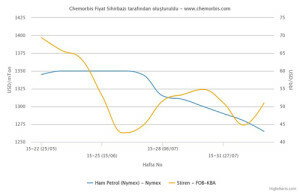 While energy markets posted sharp decreases, spot styrene prices remained indifferent to these developments in Europe. Spot styrene values even recovered some earlier losses in the region, by edging $30/ton higher on FOB NWE basis. Although spot styrene is generally sensitive to the moves of crude oil, the reason behind styrene’s defiance of crude oil’s drop is the upcoming shutdown at Trinseo. Trinseo is reportedly conducting a maintenance shutdown at its 300,000 tons/year styrene unit. The unit is expected to remain offline throughout September. Players now think that the firm stance of styrene may give a boost to the downstream PS market, where large decreases have been occurring for this month. 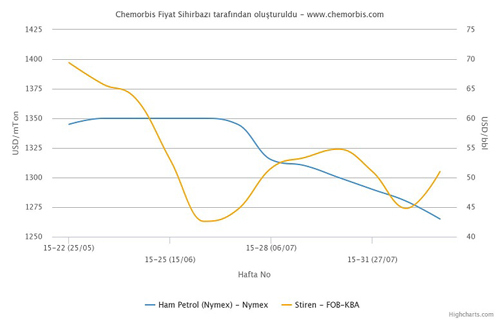 According to ChemOrbis, Asian styrene prices, meanwhile, responded to the plunge in crude oil in a limited way. Spot values lost $25/ton on average this past week. The fact that the region is also preparing for several plant shutdowns in Taiwan between August and November has put a cap on the decreases seen on spot styrene values this past week. Market players estimated that a little over 1 mil tons/year of Taiwan’s styrene capacity will be shut between August and November, with the heaviest schedule in September. Formosa, Grand Pacific Petrochemical and Taiwan Styrene Monomer all have scheduled plant shutdowns during this period.